Albany Down are delighted to have won a place at the Semi Final of this national competition in search of Britains best emerging Blues talent. Albany Down playing their new song "Dirty"at the Man on the Moon Cambridge 10 December 2010. Albany Down websites have been given a New Look! Check out the new Myspace, Twitter and Facebook. Albany Down are proud to have been awarded Finalist of the prestigious 2010 International Acoustic Music Awards for their song "Without You"
OFFICIAL VIDEO - " I Won't Wait"
Albany Down are proud to release their Official Video of " I Won't Wait Wait" recorded in London July 2010. 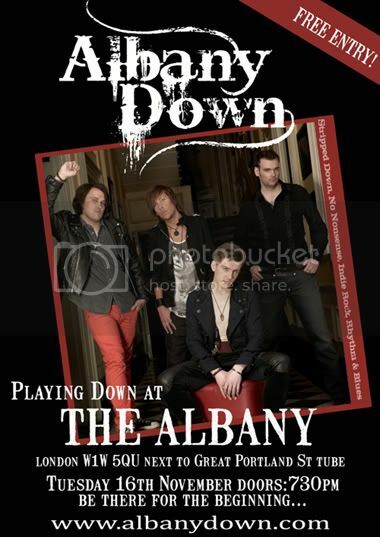 Check out Albany Down's latest review performing LIVE at the HOBGOBLIN earlier this month. Down load AD's brand new single NOW! Albany Down New Album - "South of the City"
Albany Down are pleased to confirm the title of the New Album as "South of the City"
In the run up to the Launch of their new single, Albany Down will be Performing "The Tour"
Over the past few weeks Albany Down have been busy recording their new Album at the Modern World Studio. Copyright © 2005-2019 Albany Down. All Rights Reserved.